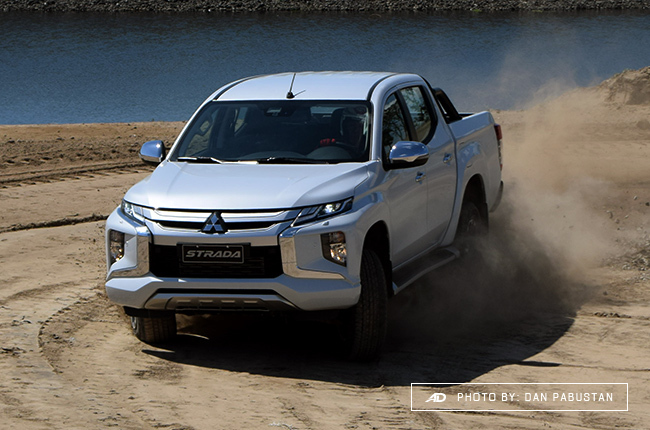 Hiroshi Masuoka let us experience the extreme off-roading capability of the 2019 Strada. 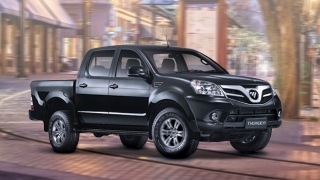 There used to be a time when pickup trucks are commonly seen at construction sites, hauling construction equipment and materials. 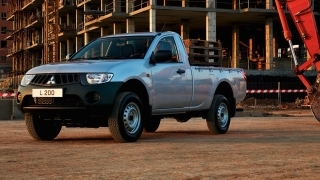 Those were the old days; pickup trucks have come a long way from a light-duty machine to being a daily driver. 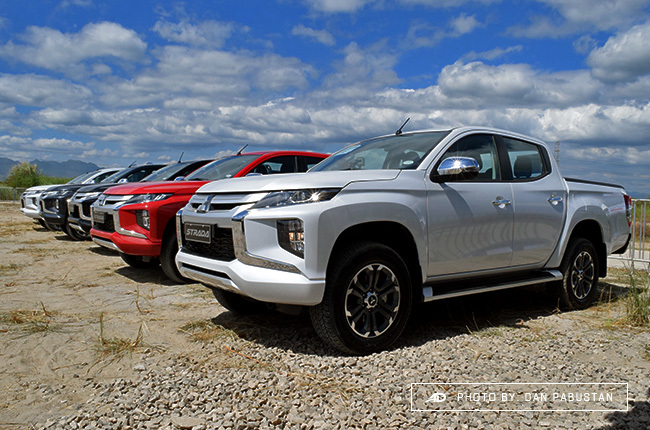 You can even observe it in the way their designs have evolved, just like Mitsubishi Motors Philippines Corporation(MMPC)’s 2019 iteration of the Strada. 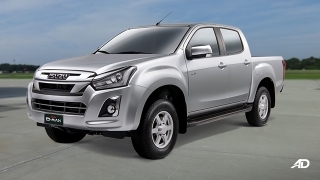 Debuted on the dirt tracks of Pradera Verde in Lubao, Pampanga, the new Mistubishi Strada has pulled the diamond brand up the hill of modern midsize pickup trucks. 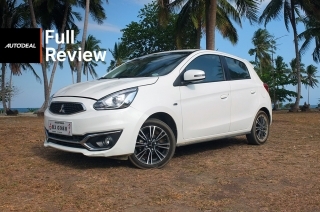 It may have been a bit late compared to its rivals, but the launch, along with a demonstration of a professional international rally title-holder, made it all worth it. Simply put, the Strada is now flashier than rugged, thanks to the Dynamic Shield signature design. However, it isn’t just flashy all the way, as being ‘rugged’ could still be seen on its muscular body. 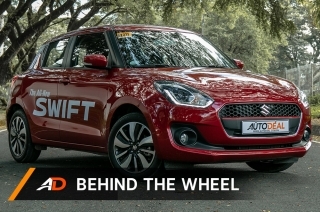 The wheel arches have these strong strokes outlining the wheel wells, so as the entire front end that’s bulkier than the old model. 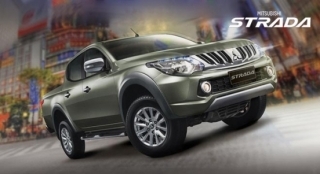 The ‘X’ face, made up of the slim headlights, dynamic C-shaped chrome accents, and huge fog lamps, welcomes the 2019 Strada to the latest lineup of the Japanese marque. Allow me to just state this one, the 2019 Strada isn’t here to fake its claims. MMPC designed, modified, and prepped it with a goal in mind: grasping the taste of modern Filipino buyers. In that sense, I could say they did pretty good in restyling the exterior. 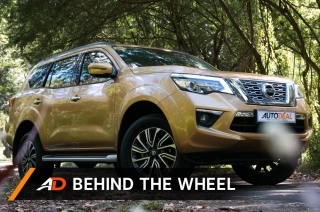 Making it look like the Montero Sport is a smart move, as it happens to be one of the most popular midsize SUVs in the country. 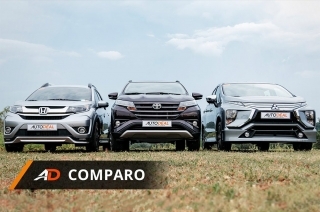 Not to mention, the similar-looking Xpander did get a warm welcome during its arrival. 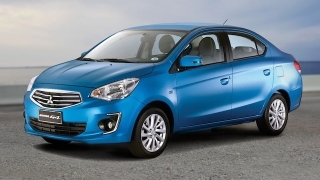 I guess Mitsubishi’s ‘Dynamic Shield’ is doing exactly what it was meant to do. The 2019 Strada is one of the highlights of late 2018 and early this year. In fact, we received quite a number of inquiries and questions about the 2019 Strada. People were curious if this truck performs as good as how it looks and, honestly, I felt the same. 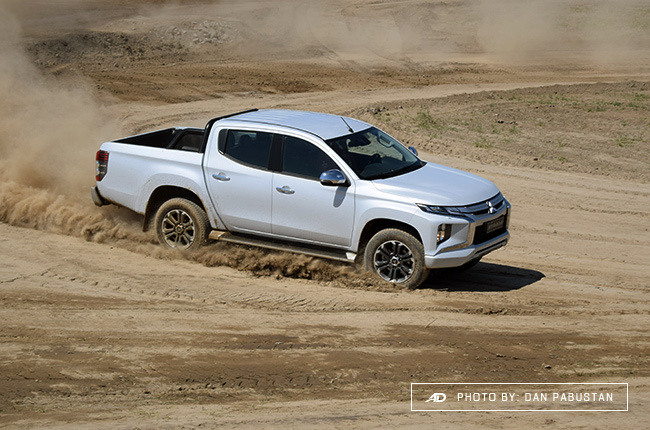 Good thing MMPC granted everyone present in the launch (me included) the chance to test it, not only on a normal track but on a dirt track, which is perfect for experiencing its innate capabilities. Does the 2019 Strada offer more underneath the Dynamic Shield facelift? 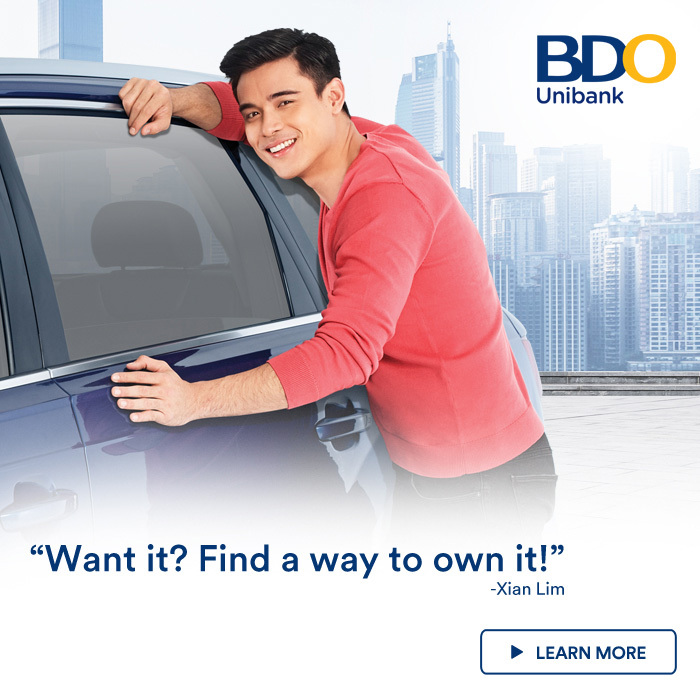 MMPC’s confident that it does and after driving it myself, I can say I am, too. Let me tell you how seeing the pickup truck up-close and driving it around made me feel like, a guy who isn’t actually a fan of the nameplate in the past. 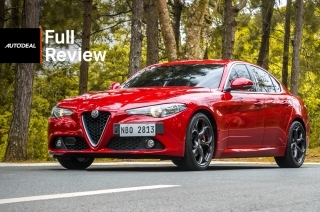 This is in no way a 2019 Strada review, but it's close. This is a once-in-a-lifetime experience I have gotten myself into. 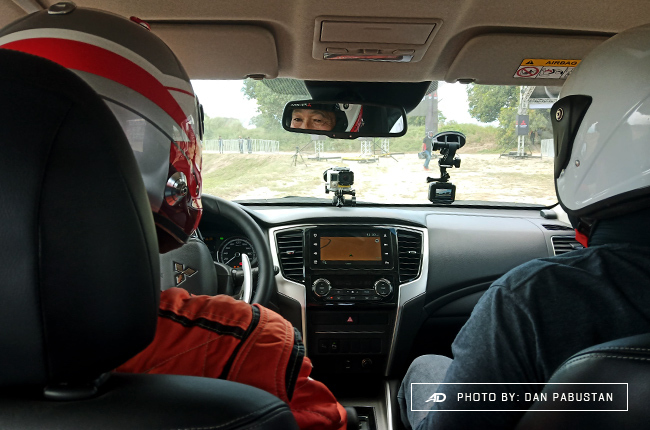 It took a while before it fully registered in my mind that the one who was about to take me around the track is the two-time Dakar Rally champion Hiroshi Masuoka. After putting my balaclava and helmet on, I knew it was going to be the highlight of my week; perhaps, the entire month. Trust me, the experience riding inside a vehicle with an off-roading champion is wilder than you’ll ever imagine. 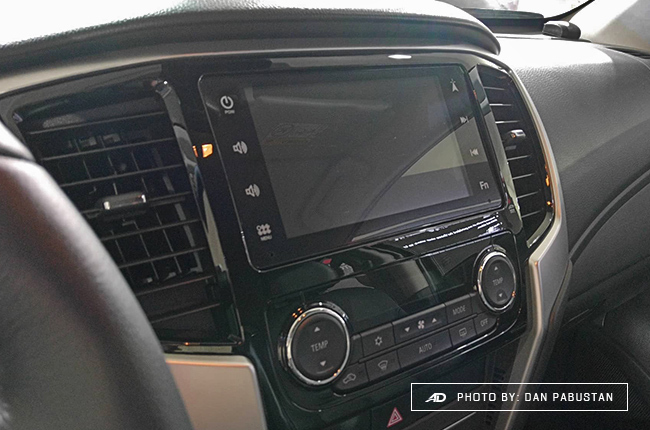 Even for two short laps, Masuoka was able to demonstrate everything that needed to be experienced with the 2019 Strada – minus the actual driving. There were at least two three-feet jumps if I’m not mistaken, but the suspension handled it well. 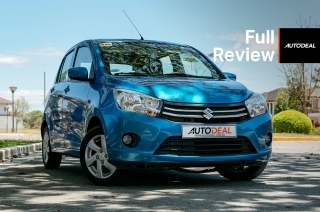 At that time, the thought of the car having traction control and anti-lock brake system isn’t actually a concern as the ride was pure adrenaline. Before exiting the track, we drove through a 30-degree inclined surface to demonstrate that the 2019 Strada won’t flip over – he said it will roll over on a 45-degree angle. Masuoka fueled my adrenaline; I suddenly felt more excited about trying out the vehicle myself. However, I know I am not a rally champion, not even close to being a rally driver. 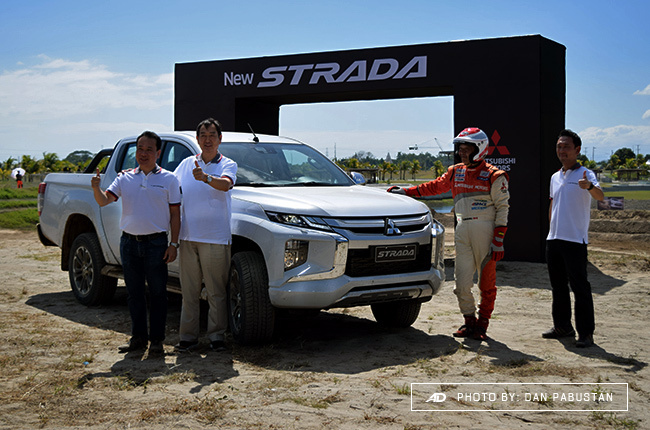 Fortunately, MMPC prepared a track dedicated to those who will test drive the 2019 Strada. 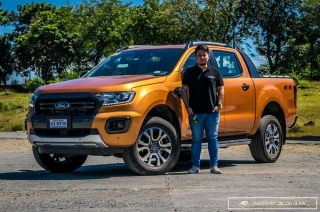 The track was made up of tight turns, inclinations, humps, and short stretches – enough to get a good experience of the truck’s power, suspension, and handling. It wasn’t that hard, as the track itself limits the drivers from driving beyond their capabilities. 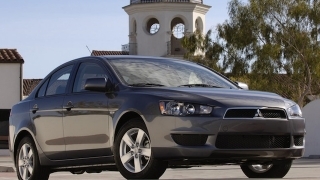 I started with the two-wheel-drive variant, as I wanted to feel the normal drive first before I go all-wheels. The first observation is that the steering was on-point – not too light nor heavy. With that, handling the 2019 Strada wasn’t a complicated task, even on hairpin turns. Speaking of sharp turns, the traction control was sharp in performing its job. You’ll really feel when the car cuts some power after your tires screech on a curve. Of course, no one wouldn’t drive like that on a public road – it was a test to demonstrate its features so I took advantage of it. Power was okay, but wait till I tell you how the 4x4 performed. Since the 4x2 only has two-wheels pulling the entire weight of the vehicle, I thought the 4x4 obviously will amuse me far better. 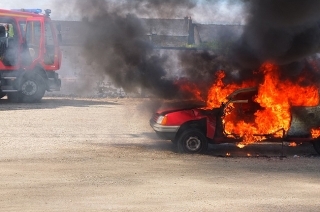 Hopped in, saw the 4WD knob set on ‘4H’, released the parking brake, and off I went. Of course, there were marshals accompanying drivers in the car. Mine was the calm and cool type; he talked about how I will be able to differentiate the 4x2 from the 4x4 after the run. He wasn’t joking. 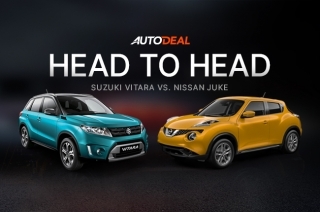 The power of four wheels working together was dominating on the dirt track. No wonder I heard more screeching from the tires, which he pointed out as the traction control at work. At a short stretch, I was asked to “floor it” to see how much power hides underneath the hood. No surprise, it was obvious that the acceleration on the 4x4 is quicker than the 4x2. When I braked as I approach the sharp left after the stretch, the pedals began vibrating as the ABS engaged. Well, even though the 2019 Strada range only has one engine option, for me, four wheels are still the way to go. 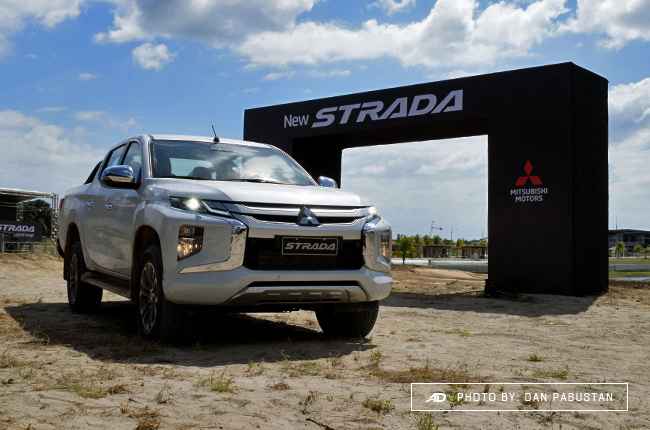 Now, the test drive may have perfectly showcased the most significant aspects of the driving experience riding the 2019 Strada. However, it left out a few other features which are significant, as well. 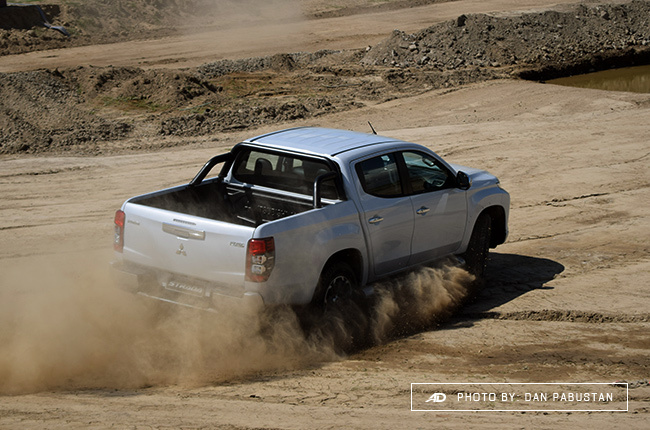 Scanning through the specifications sheet, the Japanese pickup truck has more to offer than what I have experienced on the dirt track. 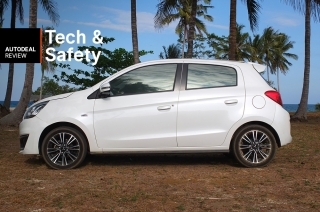 As a counter to the sudden unintended acceleration (SUA) controversy, the 2019 Strada features an Ultrasonic Misacceleration Mitigation System (UMS) that prevents accidents from a standstill position. 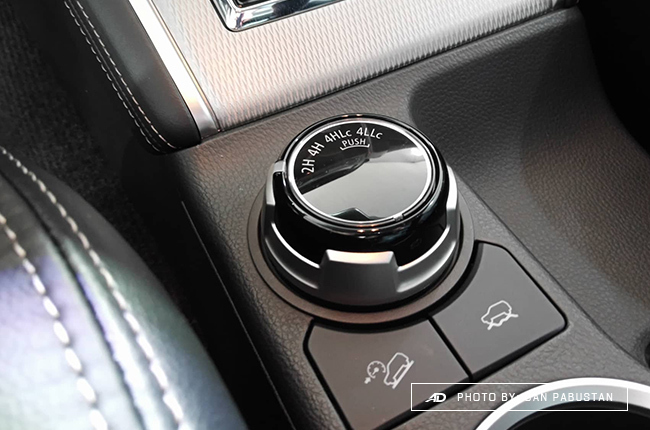 It controls the engine output when the accelerator is abruptly pressed and the sensors detect an obstacle in front of or behind the truck. 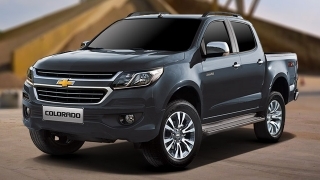 Another feature worth mentioning is the Trailer Stability Assist, which stabilizes the vehicle and trailer – a crucial feature for those who usually pull a trailer using their pickup truck. 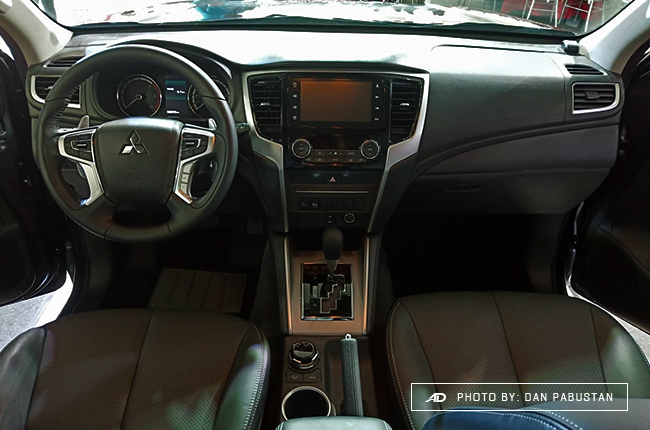 Other safety features include the forward collision mitigation system, blind spot warning system, hill-start assist/-decent control, and the Mitsubishi Active Stability and Traction Control (MASTC). Oh, one thing that sets the pickup segment apart from the old stereotype is the presence of ISOFIX anchors for baby car seats. Who would need an ISOFIX in a construction vehicle years ago? For those of you who still haven’t seen its price, MMPC released prior to the launch. 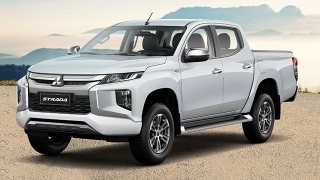 According to the papers, the base manual variants (GLX Plus 4x2 and GLS 4x2) of the 2019 Strada retail at P1,165,000 and P1,225,000. 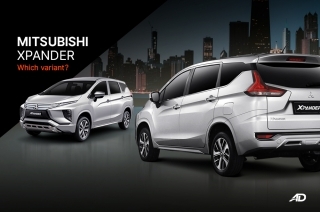 The GLX Plus 4x2 and GLS 4x2 automatic variants, on the other hand, are at P1,240,000 and P1,300,000. 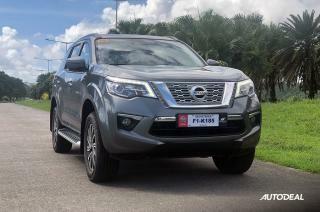 For the 4WD range, the GLS 4x2 MT has a price tag of P1,445,000, while the GT 4x4 AT can be acquired at P1,670,000.